Got those nice brown overly ripe bananas sitting in a corner? PERFECT. This is the best way to use those full flavored mushy bananas! This recipe is so easy to make. Not only will you get a warm delicious loaf, you get to save food from being thrown out as well! Mash the banana in a bowl with a potato masher. Add in the bananas and mix well. Gradually add in the eggs till it is well blended. Pour into the loaf pan and bake for 45 mins, or until an inserted toothpick comes out clean. 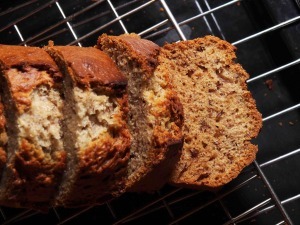 This recipe uses only baking soda because the ripe bananas are acidic enough to balance this chemical leavening system. can you guys share a recipe and conditions needed for white bread baking. We recommend you attend our Academy classes, the most beneficial one in this case would be The Production of Artisan and Healthy Breads.